Animated video - What is your Student's Union? | Mair Perkins Ltd.
Everything you ever wanted to know about the University Derby Students' Union in a bite size animation. Commissioned by the University of Derby Students' Union to summarise the Union's role in a short, engaging message. It aims increase student awareness and involvement with their Union. 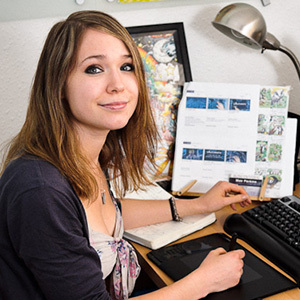 Mair has been an excellent member for staff for the Union, always meeting the brief and producing some really excellent animations that the Union and University value – I can honestly recommend her to anyone that requires the skills of an animator / illustrator. The animation has saved staff time in the busy induction time of year at the University. Previously members of staff were required to attend many student inductions to explain the Students’ Union role. Now this animation is played so there is a short, attention grabbing and memorable message. The animated video is also used on the Students’ Union website front page to quickly explain to visitors what the organisation does. It is also displayed on screens around campus and in the Students’ Union quarter. It has received positive feedback from staff and students and helped increase awareness the blue square brand of the Union. The Students’ Union submitted the animation to the 2011 NUS awards. It was nominated for an NUS Award for Technology and Innovation and received a finalist position. The UDSU later required a video to promote the National Student survey and to communicate the importance of completing the survey. This video was produced in 4 weeks and continued the style and graphics used in the “What is your Students’ Union? video. The University of Derby Students’ Union created an animation for student inductions that described what the Students’ Union is and does in less than two minutes. The aim was to revolutionise student inductions to make them more fun, interactive, engaging and relevant for a media savvy audience as well as introducing new students to the Students’ Union. We involved students at all levels within the project and employed Mair Perkins a current University of Derby Visual Communication (Animation) student to create the animation and a recent University of Derby graduate Travis Peters to execute the voice over. The feedback from students, Students’ Union and University staff involved has been overwhelmingly positive and due to the popularity and success of the Students’ Union animation we have since developed an animation about the National Student Survey (NSS) which the University used to promote the key benefits of completing the NSS. The animations have been a fantastic project for the Students’ Union and we would like to say a big thank you to all the students and Students’ Union staff involved in the project especially to Mair who created the animation and brought the ideas to life. The Students’ Union is looking forward to building more animations in the future in order to improve communication and awareness with our membership.